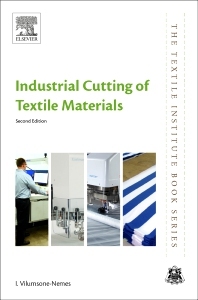 Industrial Cutting of Textile Materials, Second Edition, is a comprehensive guide to cutting room operations, offering step-by-step information on processes, technologies and best practice. This new edition is updated to present the latest advances in automated cutting technology, including advanced spreading methods and machines, advanced knife cutting systems, and pattern matching methods processing garment, home and technical textiles. Drawing on her extensive practical experience, the author begins by reviewing initial steps, such as unloading, sorting and quality control of materials, before discussing subsequent operations, including lay planning and marker making, manual and automated spreading and cutting, fusing of cut components, and final work operations such as sorting cut components for further joining. The book also covers manual and advanced automated marker making, spreading and cutting methods for more intricate fabrics, such as striped fabrics and fabrics with check, motif and border patterns, narrow lace and fabrics with pile. With essential information on cutting room operations and best practice, this book provides engineers, technologists and managers with the knowledge they need to maximize accuracy and efficiency, to control production processes effectively, and to improve product quality. The book also enables academics and students engaged in the field of textile and clothing technology to gain a solid understanding of cutting room procedures. Technologists, engineers, managers and other manufacturing specialists of different industries using textile materials; academics, undergraduate and postgraduate students in textile and garment technology. Dr Ineta Vilumsone-Nemes is Assistant Professor at the University of Novi Sad, Serbia. She has conducted academic research and worked in textile manufacturing for more than 20 years in Latvia and Serbia, including working with garment manufacturers from several European countries. She is now an independent consultant and lecturer in garment production technologies and management.